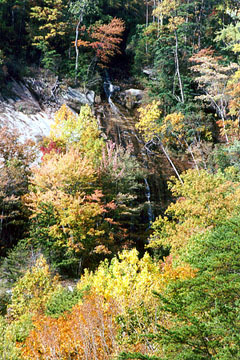 Ashmore Falls are in the 560-acre Ashmore Heritage Preserve, which is part of the Mountain Bridge Wilderness in northern Greenville County. According to the S.C. Department of Natural Resources, the preserve provides habitat for rare plants including Indian Paint Brush, Grass-Of-Parnassus and Piedmont Ragwort and rare animals including the Green Salamander and Rafinesque's Big-Eared Bat. At the preserve entrance, follow the graveled road downhill and cross a shallow creek (West Fork). Bear right - ignoring the faint trail to the left - as you go uphill, then right again onto broken pavement as you reach an intersection at the top of a hill. Stay on the broken pavement as it turns steeply downhill to the left at the next intersection. You should arrive on the dam of three-acre Lake Wattacoo opposite the waterfall. 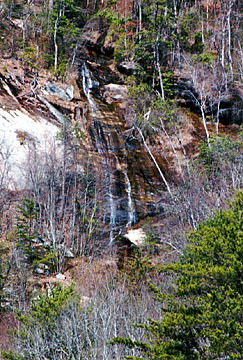 Wattacoo Creek slides an estimated 150 feet off the mountainside. Go after a heavy rain if you want to see significant waterflow. With all the hardwood trees in the preserve, the turning leaves should be spectacular in the fall. If you follow the trail/road around the lake and over Wattacoo Creek, you will arrive at the second intersection you passed through on the way to the pond. Directions: Ashmore Heritage Preserve is off Persimmon Ridge Road between Jones Gap and Caesars Head state parks. 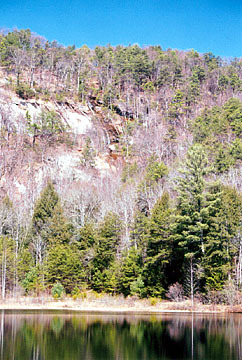 Its eastern entrance is one mile prior to Wildcat Falls on the combined US 276 / SC 11 near Cleveland. The road is just past a produce store and the entrance to Camp Spearman. Turn right and drive approximately one mile up a steep paved, then graveled road until you reach the Ashmore preserve entrance on the right. 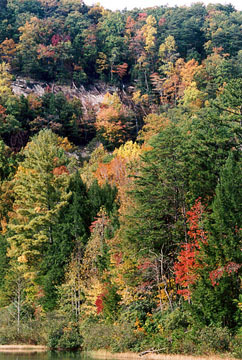 Park at the pulloff below the preserve entrance. Several heritage preserves can be accessed from Persimmon Ridge Road. For more details, contact the S.C. Heritage Trust Program at 803-734-3894 or P.O. Box 167, Columbia, SC 29202.